The following titles are available to order direct from this website or direct from the publisher. Click on the link below the description to order them via email or from the publisher’s website. 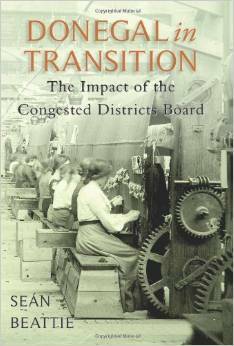 In this accessible and lively new book, historian Seán Beattie explores the dramatic impact of the Congested Districts Board (CDB) on the economic, political and cultural life of Co. Donegal. The starting point is the year 1891 when Arthur Balfour as Chief Secretary established the CDB as a regional development agency for eight western counties, including Donegal. At that time, the county was recovering from the effects of the Land War and a series of bitter harvests. In an attempt to end the cycle of poverty, the CDB set out to raise living standards by promoting industrial development, investing in maritime resources, increasing agricultural output, opening up new opportunities for women through arts and crafts, introducing the concept of self-help at local level and breaking up large estates for the benefit of tenant farmers. In 1923, when the CDB closed its doors, it could claim to have succeeded in its objectives in significantly improving economic and social conditions in the county. There are many ancient monuments in Inishowen, including stone circles, standing stones, megalithic tombs, promontory forts, Grianán of Aileach, castles and others. This comprehensive 72-page guide makes for essential reading for all with an interest in the area, whether they are tourists or have lived in Inishowen all their lives. The book contains images of all the monuments as well as providing historical and other relevant information about each site. Inistrahull is a small island lying 7 miles off the coast of Inishowen, making it Ireland’s most northerly island. In this book, Sean Beattie outlines the history of the people, the buildings, folklore, geology and legends of the island. The book combines many rare photographs of the island and its sites of interest with excerpts from the diary of a lighthouse-keeper who lived on the island, stories, legends and other historical information. Buy this book directly from Seán for €8 + p&p. This handsomely produced book contains over 30 paintings of the beautifully wild landscapes of Inishowen by local artist Ros Harvey. From the royal hill-fort of Grianán of Aileach, the mountains and valleys of Inishowen appear in all their splendour and majesty. Sean Beattie and Martin Lynch provide the history and legends associated with the area. Truly a must for anyone with an interest in Inishowen, this delightful book makes an elegant gift or keepsake which will always be treasured and admired. Buy this book directly from Seán for €25 + p&p. A new version of a folktale from southwest Donegal. The magical nature of the tale is wonderfully expressed in the evocative artwork. In iardheisceart Dhún na nGall atá Loch an Dúin agus oileán beag ina lár. Oileán mistéireach é. Tá a lán seanchais ina thaobh. Bhí cónaí ar bhandraoi ann fadó, í féin agus a bó, Donn. Ar bhainne amháin a mhair an bandraoi sin. Baineann draoícht nach beag le scéal Bhandraoi Loch an Dúin. There is a little island in the middle of Loch an Dúin in South West Donegal. It is a mysterious island. There are a lot of folktales about it. A witch once lived there, a long time ago, along with her cow, Donn. The witch lived on milk alone. There is a lot of magic in the folktale of the Witch of Loch an Dúin. Information on McGee’s life and escape from Tremone Bay, Carrowmena, to Canada, where he became one of the founding fathers of the state of Canada. Buy this pamphlet directly from Seán for €5 + p&p. Publication date November 2011. Sean Beattie argues that in some areas of Donegal standards of living were quite comfortable over one hundred years ago. He has examined the deposits in post office savings accounts in the county and in 1907, almost one third of a million was saved. Moville post office had the second highest amount saved at £19,164. There were 526 account holders. A chart shows the steady rise of deposits from 1881. Banks and loan funds also held substantial amounts. When these sums are added up and the exports of agricultural produce from Moville pier are included in the picture, it is clear that this was not a community living in dire poverty. Other articles include a survey of Liam McCormick’s churches, Arranmore, Tory, Donegal friary, the Wilsons of Ballybofey, Colmcille the Gardener, the history of cricket and the spread of plague and cholera. Sean Beattie examines the growth of Freemasonry in Donegal from 1757 and examines the lodges of Moville, Raphoe and Inch. The county had many Catholics in the Order and he profiles prominent Masons such as John Toland of Clonmany and Major McClintock of Inch who served in WW1. The landlord at Falmore, James Steele Nicholson was also a Freemason and had masonic insignia over his door but he never joined Moville Lodge. Historical figures profiled include Peadar O’Donnell, Dr. Niall O’Glacan who battled with plagues and served in the Spanish court, Bishop Farren of Derry and how he bought Nazareth House in Fahan, the Cunninghams of Ballybofey, the poet Dominic O’Kelly and Cahir Healy, MP who was born in Mountcharles in 1877. Two cross-border articles are the story of the short-lived Guild Theatre in Derry and the beginnings of the hostilities in Northern Ireland in 1968-9. A plane crash at Abbeylands, Ballyshannon is recalled and there are matters of archaeological interest from Ballyshannon and Carrowmore monastery in Inishowen. A picture of Glencolmcille by R. Kent adorns the front cover while a rare map showing part of Donegal from the Doge’s palace in Venice can be seen on the back cover. Buy this book directly from Seán for €20 + p&p. Sean Beattie profiles one of Donegal’s longest serving MPs, Swift MacNeill who served for Donegal South from 1887 to 1919. He championed Home Rule and fought for the relief of distress in the county. Other prominent characters are the Herdmans of Sion Mills who owned property in the Rosses, poet David Cunningham from Ballybofey, educationalist Pat Cannon, Bishop Charles Inglis of Glencolmcille, the Hon. Hedley Strutt of Manor Vaughan and Charles Boyd of Ballymacool, Letterkenny. Brian Lacy reviews medieval pilgrimages in Donegal and there are articles on the IRA, Ardara, Ballykinlar internment camp, Desertegney church and Ballybofey disturbances. Lots of rare photos. Cover shows a unique view of Lifford in 1815 by Major Read. This edition has a variety of articles on the Earls of Arran, the GAA, Whaling in Inver and Cochranes of Redcastle. See Sean Beattie’s article: “Cottage Industries: Arts & Crafts in Donegal”. There are also interesting photos of the Cochrane family 1886 and many others of Donegal interest. For Contents see Donegal History. This edition celebrates the Rebellion of Cahir O’Doherty in 1608, with 7 articles related to the period. For Contents see Donegal History. This Annual celebrates the Flight of the Earls in 1607, with 9 articles by leading historians on the Flight. See also: “Parish Committees and the Homes of Donegal” by Sean Beattie. For Contents see Donegal History. For contents see www.donegalhistory.com and click on the link for Our Annual and click the word HERE at the bottom of the page. Cover shows Flight of the Earls painting by Thomas Ryan. 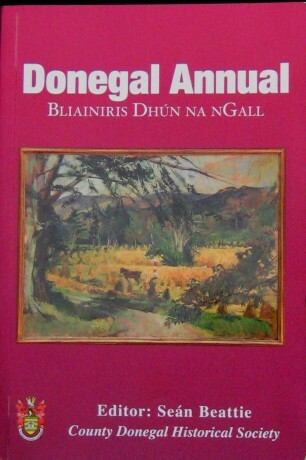 Contents of Donegal Annual 2007 can be downloaded at http://www.donegalhistory.com. 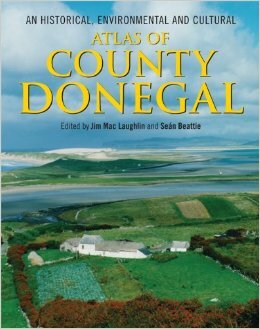 This atlas consists of around ninety articles from over fifty contributors covering a wide range of topics that are central to the cultural and natural heritage of Donegal. While the county has received a considerable degree of attention from historians and archaeologists in the past, there has been no one major work to bring together the great diversity of material written about the county’s history, landscapes and people. After decades of neglect and indeed misrepresentation this atlas seeks to literally put Donegal on the map of contemporary Ireland. Contributors are drawn from a wide range of academic disciplines and interests. They include established authors and academics, as well as competent local scholars whose work merits publication. 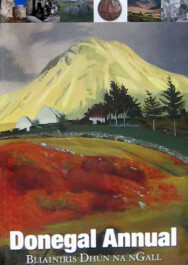 The editors, who have also contributed very substantially to the volume, have sought to ‘raise the bar’ in regional studies in order to set a high standard of scholarship, and writing, to make this a volume that will be consulted by those interested in the history and heritage of the county for many years to come. Thus contributions range from short pieces of 1500 words, to specialised chapters of 7000-10000 words. 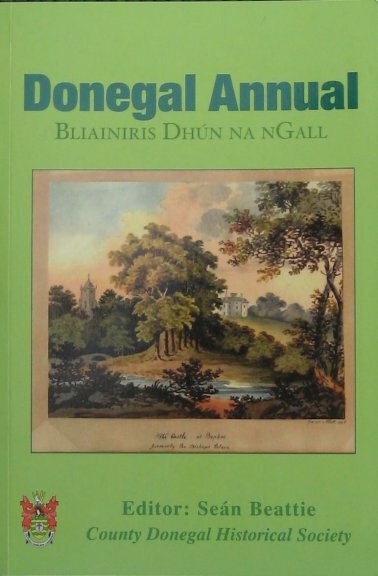 This richly illustrated atlas also has a very strong heritage focus in that the historic, archaeological, natural landscapes and the built environment of the county are treated as powerful elements of Donegal’s cultural heritage. Thus topics include historic and recent emigration, Gaelic language and literature, musical traditions, the marine environment, fishing and the coastal economy, textile industries, the history of tourism and travel, art and architecture, Ulster Scots and Donegal’s Presbyterian community, material culture, farming, the history of rail, newspapers, sport, the natural and physical landscape and urban-rural relations. Buy this book from Cork University Press. Irish Academic Press in association with Oxford Brooks and QUB have published Sean Beattie’s research on the Donegal philanthropist Alice Hart in their new book calledPoverty and Development in Ireland 1838-1948 (Crossman and Gray, editors) in 2011. Alice Hart’s promotion of the cottage industries won the support of all sections of the community in Donegal. Some of the main beneficiaries were women who worked in the home. She established the Donegal Industrial Fund and exhibited Donegal craft work at industrial exhibitions in Ireland and America in the 1890s. Buy this book from Irish Academic Press. This paper has been published by Winthrop University in South Carolina, USA and is written by Sean Beattie on Donegal industries. Sean Beattie has brought together nearly 200 pictures from the last 150 years, many never published before, to create a photographic portrait of the county of Donegal. From the streets of Donegal town itself to the county’s beautiful islands, from schools to farms, from golf courses to bustling markets, from holidays on the beach to poignant images of emigrants aboard ship waiting to leave Ireland for a ‘new life’, this collection of pictures reveals all aspects of Donegal’s life over the last century and a half. It includes images of Eamonn de Valera at Glencolmcille, a rare stereoscopic photograph of the children at Terryrone National School in Inishowen and many other fascinating slices of the county’s life. Buy this book from The History Press. I’m very impressed with your books, maybe some day I will get to read them. Indeed it has been a long time since we knew each other. Do you still live out the Malin Road in Moville? I go back nearly every year to Derry, but I have not been there since January 2011 and we always have a few runs to Moville, Drumawier, Greencastle and Shrove. While growing up my family always had the month of August in Drumawier, upper road, we loved it even if it was raining, usually was! I came back to America in February 1965, Married in 1966 and enjoyed living in New Jersey, Boston, San Francisco, near London , England, Maryland and back to England and my husband retired from the U. S. Navy in September 1981. We settled in New Jersey, but sadly he died suddenly on December 4, 1989 at the age of 48 of a heart attack. I am now a widow for as long as I was married. I have good children and grandchildren and have always been lucky to have wonderful friends. I went back to work for a while but have been retired now since 2007. I love Florida, when you were in Fort Lauderdale did you visit Hollywood ? its right beside me. Fr, Paddy O’Kane from Culfaff and Holy Family Church in Derry, has visited me often in New Jersey when I lived there. Did you remember Kevin McGonagle, my cousin, I know he was with you at St. Joseph’s. I saw Kevin last year when I was in Derry, he is now retired. I often wondered about Rosaleen Doherty from Main Street, Moville, remember she was in The Gondoliers with us. Do you know does she still live in Moville? I love Facebook as I have found friends all over the place and its good to good times together. Good Luck with your new book and I look forward to hearing from you again.